Over the years I have become a big fan of natural products. Things such as cleaning supplies, makeup, and bath & body products. Recently, I had the opportunity to review some natural soap products from Dr. Jacobs Naturals. For the review, I was sent the Almond Honey Face & Body Wash, Eucalyptus Face & Body Wash, and Lavender Loofah Exfoliating Bar Soap. These products are some of the most amazing natural products I have tried, and I am thrilled I get to share them with you. Dr. Jacobs Naturals products are free from all the nasties: NON-GMO, Paraben Free, Sulfate Free, Gluten Free, Free of artificial dyes & coloring. PETA Cruelty Free & Vegan. I love the smell of the Almond Honey face & body wash. This product literally drifts you into relaxation. I love how the product lathers on my skin, after I am done using it, I feel like my body is soooo clean. When you rinse off, no residue is left behind, just clean and smooth skin. The soap offers a pleasant lingering scent that remains in the air long after taking a shower. The scent is subtle enough to not overcome perfumes, but pleasant enough to be enjoyable, like a bonus air freshener. Eucalyptus is an essential oil that holds great importance in aromatherapy. Eucalyptus has a cooling effect on the sinuses and a refreshing effect on the mental state. This natural essential oil has a fresh and invigorating scent. With its fresh and clean scent, it is a potent antiseptic. The Eucalyptus leaf is used for infections, fever, upset stomach, and to help loosen coughs. Eucalyptus oil may also have antibacterial, anti-inflammatory and analgesic properties. Directions: Pour on a washcloth, sponge, or hand. Lather and rinse. Ingredients: Aqua, organic coconut oil, olive oil, sunflower seed oil, potassium hydroxide, glycerin, eucalyptus oil, citric acid, caramel. Oh, Eucalyptus, and all of its many health benefits. This scent is amazing and helps with so many issues, such as allergies and sinus trouble. Eucalyptus really has the power to get you breathing better. I find the scent to be stimulating as well. Even if I am in a bad mood, this scent always makes me feel a calm sense of relaxation. Just like the Almond Honey, it cleans, rinses, and leaves your skin smooth, and offers a light fragrance on your body afterwards. I personally love to use this face & body wash when my sinuses and allergies are really bothering me. Like last night after my hubby cut the lawn. If there is one thing that can drift you off and make you feel like you are at a spa that is the scent of Lavender. The fragrance offers you a calming relaxing feeling mentally and helps me drift off to sleep at night. My body feels amazing after using this bar soap just like the other face & body washes. Your body will feel clean, smooth, and just amazing afterwards. I love the fact that there is no film left on my body after using this soap. I am very happy and impressed with these natural bath & body soap products. I love how natural the ingredients are in each of these products. I am left with the peace of mind that my family is clean from our heads to our toes when we use these products. Free Shipping Now! 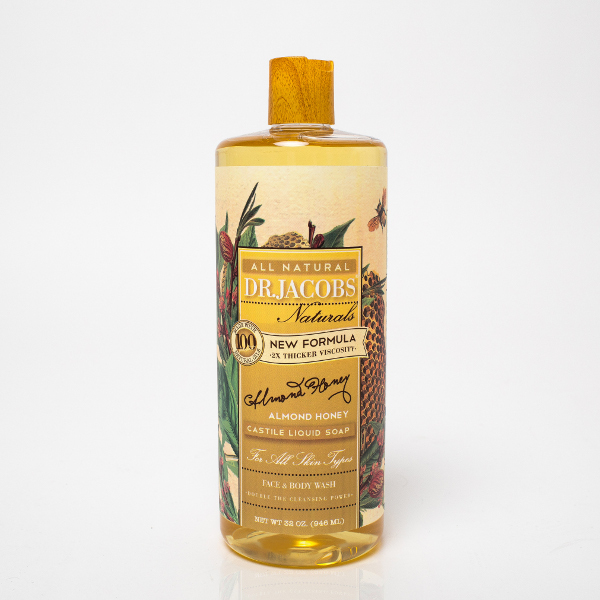 - Free Shipping on all Dr. Jacobs Naturals products totaling over $20! Use code freeship20 on Dr. Jacobs Naturals. These sound like great products. I love that they are all natural.